What are the positions for 5-a-side, and which one should I play? Two of the most common questions that get asked, especially by players who are new to the 5-a-side format of the game. Even if you’re a more seasoned player, it can take some time to settle into a particular role in any given team. The process of settling in will become all the easier if you understand the basic requirements of each position and, perhaps more importantly which position will play to your strengths and hide glaring weaknesses, like your desperate lack of pace / stamina / finishing skills / (insert other cause of embarrassment here). So, what are the positions for 5-a-side? We’ll work through these with the aid of a couple of examples. This player goes by a variety of names, but essentially they’re the main individual that leads the attack. They are always looking to keep the opposition defenders busy, acting as a focal point for the attacking play. The term ‘pivot’ is often used for this player; that’s certainly how futsal refers to them. That’s because they spend a lot of time receiving the ball with their back to goal, looking to spin or ‘pivot’ around the defender and get a shot off; but the rest of the team also pivots around them as the hold-up play of this player creates space and supplies the passes for teammates who make runs forwards. Although attacking is the pivot’s main focus, they still need to track back and help out the defense when the other team are pressing forward. You shouldn’t see teams playing with 2 pivots (though you might find that 2 players rotate the responsibility between players). However, it is common to find teams that don’t consider themselves to use a player in this position at all (e.g. in the 2-0-2 formation explained below) but if you have a specialist who can play this role well, it can be extremely effective. Movement to create space to receive the ball in, and good anticipation to read when a pass is coming. If you think that playing as a pivot is for you, there are lots of additional tips and tactics that you should know. 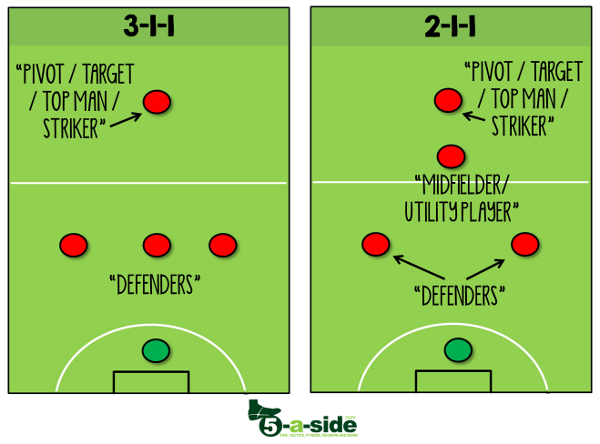 Read them here in our guide to being a 5-a-side pivot. These players are important components of a good team as they knit together the entire team’s strategy. Whilst the pivot is the focal point of the attack, and the fixo is the focal point of the defense, the wingers are the engine room that powers the whole machine. If they don’t provide enough energy to the team, then neither the pivot or the fixo get enough support to perform effectively. Their responsibilities are split broadly evenly between attacking and defending (although if you have two midfielders you might make one more attacking and the other more defensive). At times their runs will take them further forward than the pivot, and at others they’ll be even further back than the ‘last man’. As they are required to perform this dual role, the most effective players in this position have excellent stamina, tactical understanding and the discipline to balance their duties. When a good pairing of these players exists to balance the team, the whole team will feel much more in sync. Shooting ability to finish off those forward runs. A good all-round game, having the essential skills for both attack and defence. Midfielders should work on their fitness (how fit do I need to be for 5-a-side), their defensive game (our ultimate guide to 5-a-side defending), as well as their basic attacking skills. Some refer to this character simply as a ‘defender’ but it’s more than that. The terms ‘last man’ and ‘fixo’ are a more accurate reflection of this individual’s role. The term ‘fixo’ is a Portuguese term literally meaning ‘fixed’, referring to the fact that this player is usually found at the back. They’re main priority is to be the protector in front of the goalkeeper and deal with the threat of the opposition’s pivot. However, just as the pivot doesn’t just attack, the fixo doesn’t just defend. They’re certainly allowed to roam forward from time-to-time, and the unexpected nature of these attacks can make them very difficult for the opposition to defend against. Defence, however, is where the majority of their work takes place. They will often be the furthest player back, allowing them to see more of the play than anybody else, ideally placing them to assess the shape of the game (or ‘read the play’) and communicate advice to the other players. Defensive discipline – you can’t play this position well if you frequently wander off at the mere sniff of an attacking opportunity. Communication – to get messages across to other players and help organise the team. If you’re going to play this position, read our guide to the last man. In the square formation, the players do similar jobs to the above, but this time two players are more attacking and two are more defensive The roles are more general. As the name suggests, these players are primarily in charge of making things happen in the attacking area of the field. But they might not be targets in the sense that the pivot usually plays the attacking role. With two attacking players, it can make it harder for a ‘last man’ to man-mark either of them, since they both get forwards at different times (and often at the same time) switching to disrupt the defense. Attackers in these positions ensure that they get back to defend when they’re not in possession of the ball, though they will be the first to press out when they are on the attack. Technical ability – good close-control and footwork to maintain possession. Pass-and-move ability – necessary to combine with the other attacker and create opportunities. A defender is similar to a ‘last man’, but the mantle of being the defensive rock doesn’t just fall on this one individual. Instead, the defender is part of a unit. 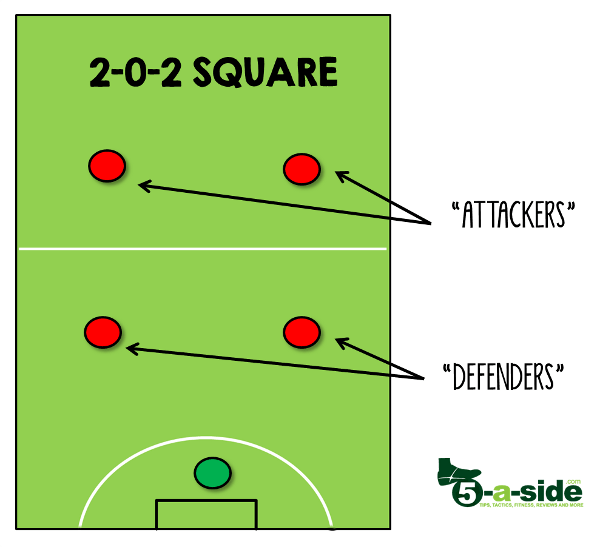 In the ‘square’ formation there are two defenders, which requires them to work together to organise the defensive duties. When the team is attacking they cannot both stay back defending, at least one of them has to move forward to provide support to the attackers. If the defenders have a good understanding between them, it can be an effective strategy to rotate the responsibility to attack. Ideally they will both have the stamina to push forward when the opportunity arises, with the other defender covering for them. However, if one begins to tire and there aren’t any substitutes available, the attacking responsibility can be given to the fresher player, allowing the other to recover. It’s all about understanding what the other defender (as well as the other players) is doing and planning around this. Defensive discipline – yes, you can push forward but remember that your main objective is to protect the goal, so you’ll need to have a focus on the defensive arts. Communication and tactical understanding, especially the ability to form a good partnership with the other defender. Which position should I play? After reading this, you should have a pretty good idea of which position might suit you best. You’ve also probably got one of these positions that you naturally most enjoy, which is often the one that you are best at anyway. So, start by playing this one. However, don’t stop there. Not everybody starts off playing the position that they’re best at, as a lot of us aren’t honestly able to assess our relative abilities to the rest of the team. Consider asking your teammates which position they think you’d be best at, and after you’ve made it past their inevitable sarcastic suggestions (likely to include ‘left back in the changing room’, ‘sub’ etc) you might get some helpful insight. The thorough way to settle on your best position, however, is to spend a couple of games playing each one, long enough that you’re able to settle into each. After trying a few, you’ll soon see which one has potential for you. The downside is that if your team is too impatient to indulge your ‘work experience’ in each of these different positions, you might find this to be a tough sell. However, with persistence, you should be able to give them all a go and even the positions that you’re not good at, you’ll at least have an appreciation of your teammates who do play them. Good for you. The above is supposed to be a fairly comprehensive list of the main positions in 5-a-side and futsal, but it’s not intended to cover every single possibility. 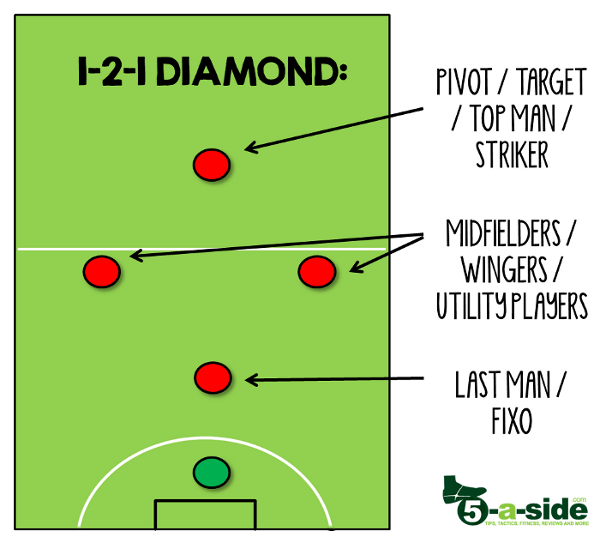 We’ve covered the two major formations and looked at the most common positions that you will see. In practice, people will have their own twists on these roles, and indeed should adapt the way they play to suit the specific individual strengths of the team. Often, you won’t have the luxury of having players who neatly fit the above moulds; they might not have all the attributes; there might be aspects of the position that you need to adapt to suit their strengths and mask their weaknesses. If you’ve got a position on your team which is different to one of the above roles, let us know in the comments below. 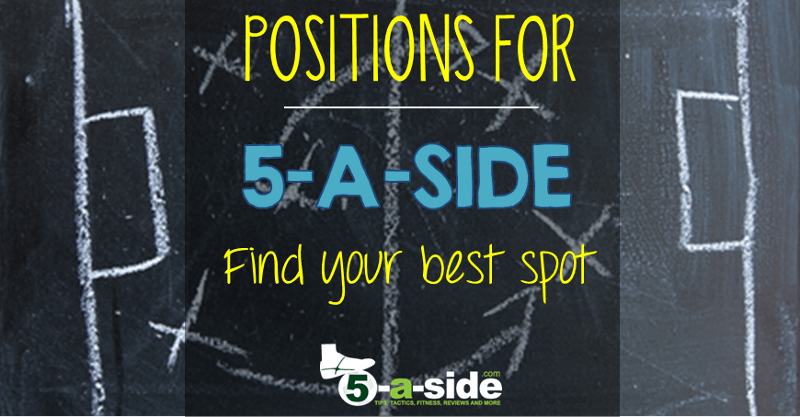 In my opinion any decent 5-a-side player should be able to do 2 or 3 of the 5 positions on your list very well. In a game we seem to find ourselves having to do each others jobs a lot of the time anyway, when the situations requires it. Adam, I agree with you there. Versatility is so useful to any team. Being able to do several positions well makes you a popular player to have on the team!